James Wilson Marshall, a foreman at John Sutter’s lumber mill near Coloma, California, was on the edge of the American River when he spotted something glittering in the sun on 24 January 1848. When he brought the shiny flakes to his boss, Sutter ordered him to be quiet while they secretly tested the material. As Sutter feared, Marshall had found gold. The two men did not know it yet, but California’s fabled Gold Rush was about to explode, and California and the United States would change forever. 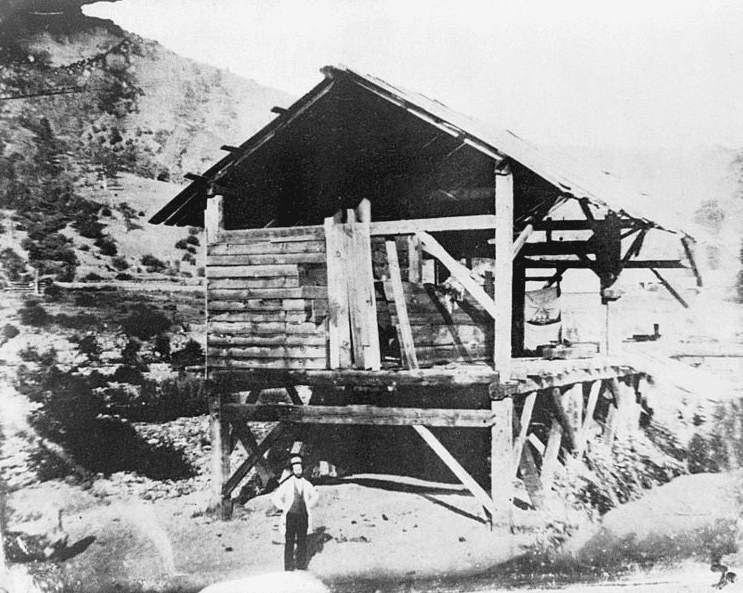 Photo: “Photomechanical reproduction of the 1850 daguerreotype by R. H. Vance shows James Marshall standing in front of Sutter’s sawmill, Coloma, California, where he discovered gold.” (Note: there is dispute whether this is actually Marshall in the photograph.) Credit: R. H. Vance; Library of Congress, Prints and Photographs Division. Sutter was dismayed because he owned nearly 50,000 acres and knew that his dreams of an agricultural empire would be ruined if crazed gold prospectors rushed in and overran his property. Despite all his efforts at secrecy, however, rumors started spreading. Men began to write letters, by the summer newspapers on the East Coast were announcing the news, and in an address to Congress on 5 December 1848, President James Polk – a strong supporter of America’s “Manifest Destiny” – officially confirmed the discovery of gold in California, helping to spur the Gold Rush and ensuring the acceleration of America’s westward expansion. California was still part of Mexico at the time Marshall discovered gold, but Polk took care of that by acquiring California with the signing of the Treaty of Guadalupe Hidalgo that ended the Mexican-American War on 2 February 1848. 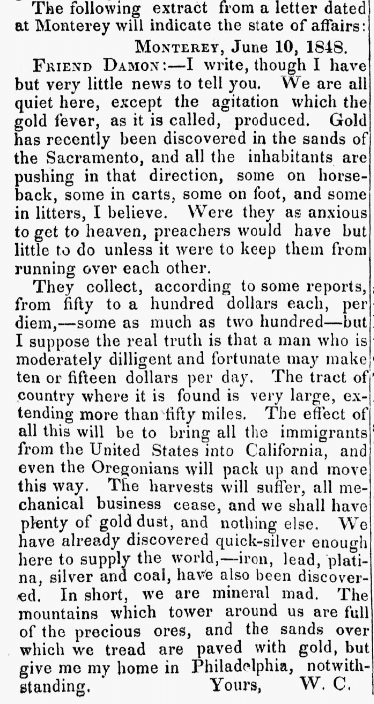 At the end of the year Polk delivered his address to Congress, and the California Gold Rush erupted the next year, as 90,000 “49ers” rushed to California in 1849 looking for the gold Polk confirmed was there. California was admitted into the Union the next year as part of the Compromise of 1850. Illustration: “How We Got Gold in California.” Credit: Harper’s Weekly; Wikimedia Commons. 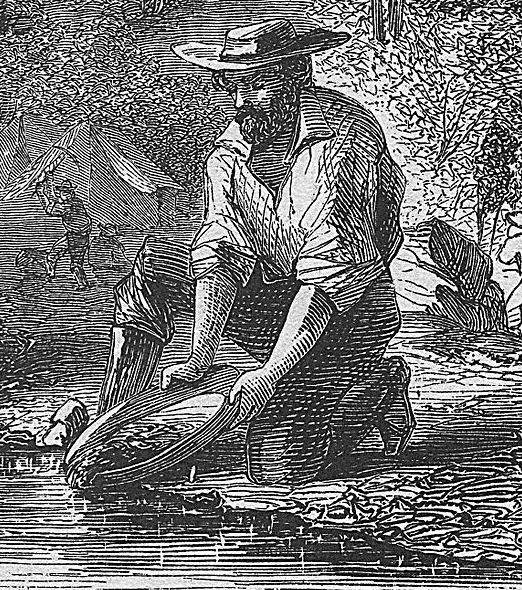 Between 1848 and 1855 about 300,000 prospectors flooded into California, mostly Americans, but tens of thousands also came from as far away as China, Hawaii, Europe, Peru and Australia. It is estimated they recovered over $7 billion in gold. It all began with that 24 January 1848 discovery by Marshall, a find that touched off an irresistible gold fever that made men abandon what they were doing and head off to California to strike it rich. 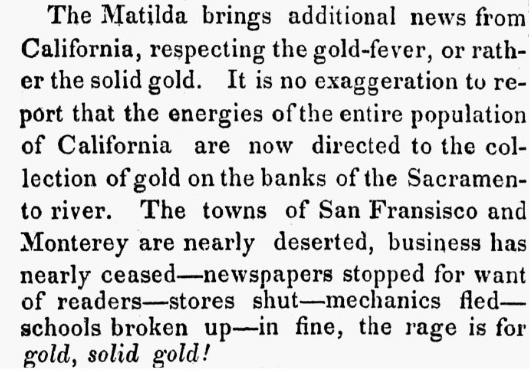 The [ship] Matilda brings additional news from California, respecting the gold-fever, or rather the solid gold. It is no exaggeration to report that the energies of the entire population of California are now directed to the collection of gold on the banks of the Sacramento river. The towns of San Francisco and Monterey are nearly deserted, business has nearly ceased – newspapers stopped for want of readers – stores shut – mechanics fled – schools broken up – in fine, the rage is for gold, solid gold! FRIEND DAMON: — I write, though I have but very little news to tell you. We are all quiet here, except the agitation which the gold fever, as it is called, produced. Gold has recently been discovered in the sands of the Sacramento, and all the inhabitants are pushing in that direction, some on horseback, some in carts, some on foot, and some in litters, I believe. Were they as anxious to get to heaven, preachers would have but little to do unless it were to keep them from running over each other. They collect, according to some reports, from fifty to a hundred dollars each, per diem – some as much as two hundred – but I suppose the real truth is that a man who is moderately diligent and fortunate may make ten or fifteen dollars per day. The tract of country where it is found is very large, extending more than fifty miles. The effect of all this will be to bring all the immigrants from the United States into California, and even the Oregonians will pack up and move this way. The harvests will suffer, all mechanical business cease, and we shall have plenty of gold dust, and nothing else. We have already discovered quicksilver enough here to supply the world – iron, lead, platina, silver and coal, have also been discovered. In short, we are mineral mad. The mountains which tower around us are full of the precious ores, and the sands over which we tread are paved with gold, but give me my home in Philadelphia, notwithstanding. August 20. – Lieut. Beale, U.S.N., bearer of dispatches from Com. Jones, commander of the squadron in the Pacific, arrived here today on his way to Washington. Lieut. B. carries with him highly interesting information in regard to the discovery of gold mines in Upper California, where there are now a number of persons working and clearing $70 a day with no other implement than a spade – men who have none but wooden spades can even with these realize at least $20 a day. From the meager information which has so far been had of these mines, there remains very little if any doubt that California is destined to become probably the richest and most important country on the continent of North America. 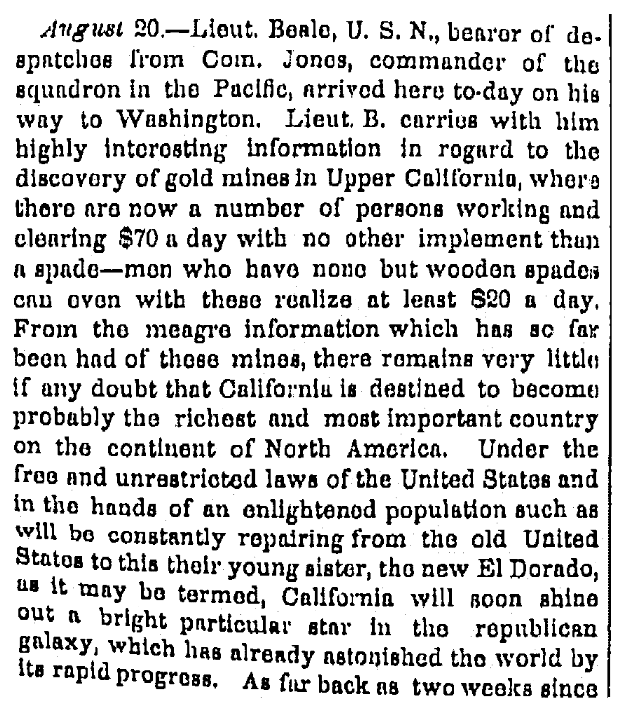 Under the free and unrestricted laws of the United States and in the hands of an enlightened population such as will be constantly repairing from the old United States to this their young sister, the new El Dorado, as it may be termed, California will soon shine out a bright particular star in the republican galaxy, which has already astonished the world by its rapid progress. As far back as two weeks since private letters were received here, one of which was read by Mr. Clifford, stating that these mines had been discovered and were being then worked by persons at distances of eighty miles apart with equal success, but at that time I did not wish to say anything on the subject, expecting some further information. The inhabitants of San Francisco, Monterey and other towns, have all deserted their homes and gone to the mines. Shovels, picks, buckets, bowls, &c. have risen most enormously in value, and indeed are not to be had by those who require them for any price. Provisions in the neighborhood of the mines are sold at very high prices, but this is a matter of small account where gold is so plenty. I cannot enlarge or add anything to the following, which I have from a gentleman who left California on the 1st inst. He says the mine or placer – the mine proper has not yet been come to – is situated a short distance from Sutter’s Fort, on the American fork. It is in extent from ninety to one hundred miles in length, and probably twenty in breadth. The entire population, even young children, have left their trade, profession or farm, to attend to the mines. With no other implement than a spade or shovel, pick axe and a bowl, a man makes sixty to seventy dollars a day, and some who have constructed rude machines get eighty and ninety dollars a day. Shovels and picks sell at thirty dollars a piece, and lumber to build shanties sells at $400 per 1000 feet. Tin pots and pans for washing sell for $5 a piece, and flour readily commands $20 per bbl. The entire population are removed to the banks of the river, a locality hitherto unpeopled. In Monterey, in the early part of June, there were but twelve men remaining; in San Francisco only ten, and these were then preparing to leave. The officers and crews of some merchantmen have gone to the mines from the latter place, and their ships are lying up. This is but the commencement; there is no telling what will be the extent of the wealth discovered when the mines commence to be worked. Note: An online collection of newspapers, such as GenealogyBank’s Historical Newspaper Archives, is not only a great way to learn about the lives of your ancestors – the old newspaper articles also help you understand American history and the times your ancestors lived in, and the news they talked about and read in their local papers. Did any of your ancestors catch “gold fever” during the California Gold Rush? Please share your stories with us in the comments section.